There’s something decidedly nostalgic -- and irresistible -- about eating raw cookie dough. It’s soft, it’s just sweet enough, you get to lick it off of the mixer beaters… and, well, it just might kill you. Or at the very least, make you very sick, according to a new warning from federal health officials. 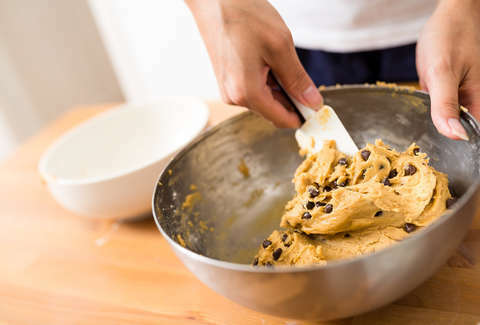 The Centers for Disease Control and Prevention (CDC) issued a warning to baking enthusiasts everywhere: Please “steer clear” of raw cookie dough and batter. The agency warns that -- and this may shock you -- consuming yet unbaked treats can make you gravely ill. Talk about a buzzkill. Confused about that last bit? Allow us to explain. According to the CDC, potentially salmonella-inducing raw eggs aren’t the only threat to your immune system lurking within your uncooked desserts (and play clay, evidently). It’s actually the raw flour that may do you in. The powdery baking agent apparently sometimes harbors E. coli, which is what makes it so dangerous. The CDC suggests you don’t consume, or even handle, doughs containing raw flour. Who knew baking and crafting were such risky hobbies? “Do not let children play with or eat raw dough, including dough for crafts,” the CDC cautioned. Twitter users aren’t taking kindly to the CDC’s recent anti-raw dough message. Many noted they’d been eating the stuff for years without getting sick, while some simply say it’s worth it. Me: That milk was opened yesterday and is therefore probably bad and going to kill me. CDC: Throw your romaine lettuce away! CDC: Cook your turkey thoroughly and sanitize everything it touched! CDC: Don't eat raw cookie dough! CDC: Don’t eat romaine lettuce. Scott Gottlieb of the Food and Drug Administration attempted to drive home the CDC’s very serious warning with what we can only assume was an attempt at a Dr. Seuss-style poem on the social media platform. His prose may have been off, but uh… sure, we get it. If you recently consumed raw dough and aren’t feeling well, please stop reading this and go to a doctor immediately. Don’t believe us? Feel free to cross-reference your symptoms with the CDC’s list of potential E. coli and Salmonella warning signs. You’ll think twice about sneaking some raw dough after reading them.